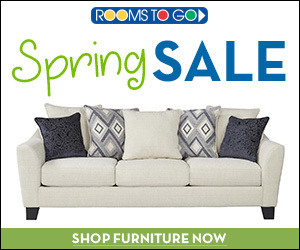 Shop ROOMS TO GO SPRING SALE and CLEARANCE. Decorating and saving money is easy at Rooms To Go. 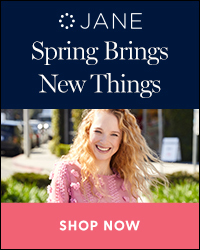 Spring Sale and Clearance going on now! 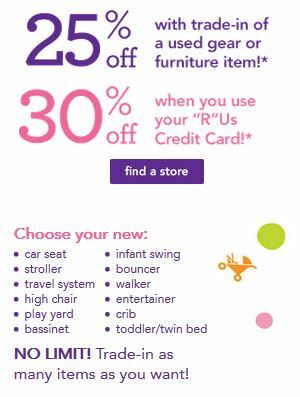 Babies R Us’ Great Trade in Event is a great time to save on baby essentials. Trade in your old high chair for a discount on a new one for Baby #2. Upgrade that carseat that’s almost too small for your growing toddler or swap the crib for a discount on a toddler bed! 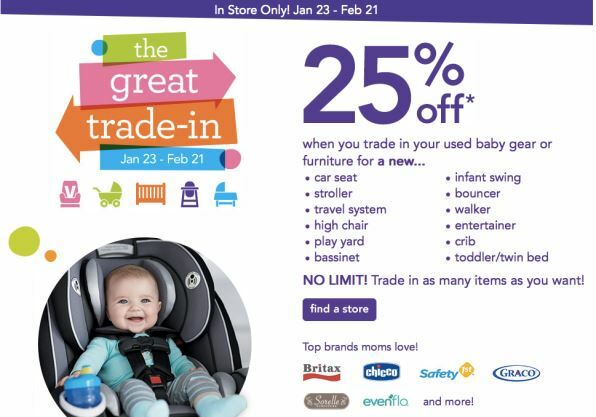 It’s that time again for the Babies ‘R Us Great Trade-in Event! The 2017 Trade In Event is happening January 20th through February 20th! There is no limit and you can trade in as many items as you want. Each item you trade in will get you 25%/30% off ONE item. Purchased items can be from different categories. (For example, trade in stroller for new car seat or high chair for new stroller, etc.) And if you don’t find an item you want, they will give you your trade in back. Be sure to price compare BabiesRUs.com with Amazon.com to make sure the item you want with 25% off from Babies R Us is the best deal. 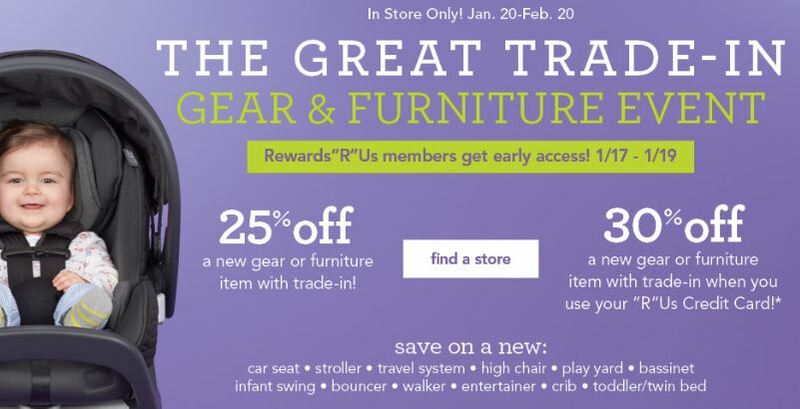 It’s that time again for the Babies ‘R Us Great Trade-in Event! 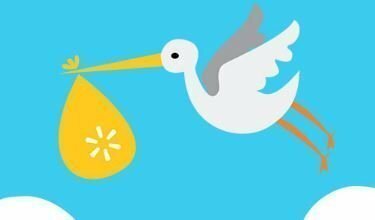 You will be able to bring in your old baby equipment and trade it in for a discount on a new item anytime between February 1st and February 29th. 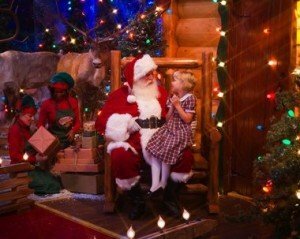 They are doing things a little differently this year, so if you’re a regular to this event, be sure to read everything through. 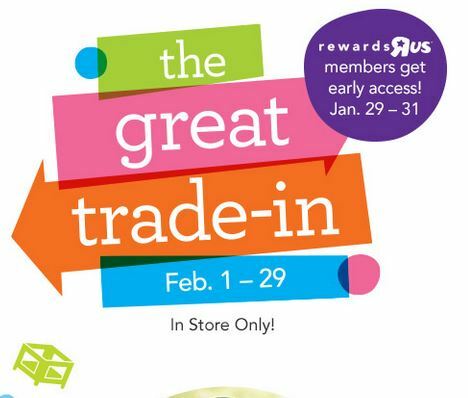 If you have a RewardsRUs Card (not a credit card, just the store membership card) you can bring your trade ins starting on January 29th. If you have a RewardRUs CREDIT Card you get a 30% discount on your new item. Non credit card holders get 25%. There is no limit and you can trade in as many items as you want. Each item you trade in will get you 25% or 30% off ONE item. We did this a couple years ago when Bug needed a car seat upgrade and was able to get a better, more expensive car seat for less than the lower priced option we would’ve had to have buy without the 25% off coupon! Through September 19th, head on over here to print a coupon valid for $10 off $25 select original, regular, sale and clearance-priced apparel, shoes, accessories, fine jewelry & home items purchase to use in-store. Or use the offer online with the code FALLSHOP at checkout. 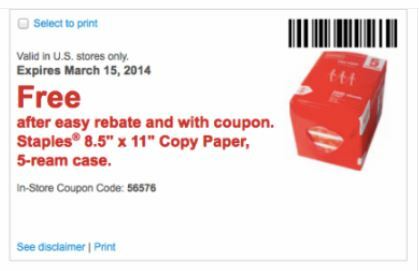 Find more deals like this at my other site Saving Toward A Better Life! Through January 11th, you can print a coupon valid for $10 off $25 select original, regular, sale and clearance-priced apparel, shoes, accessories, fine jewelry & home items purchase from JCPenney – valid to use in-store only. Exclusions do apply so be sure to read the fine print. OR, since the 11th is tomorrow, you might find it easier to shop online! Save $10 off a $25 regular, sale or clearance-priced apparel, shoes, accessories, fine jewelry & home purchase when you use the code TENXTRA at checkout. Or, save 20% off purchases over $100 or 10% off watches, furniture, mattresses and custom blinds & shades when you use the code SUPER20 at checkout. Please note that you can only use one code per order. Also, keep in mind that shipping is FREE to the store on an order over $25; otherwise, it’s free shipping on orders over $49. 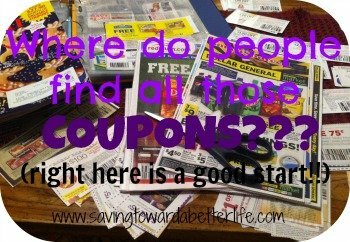 Coupons from Carter’s and Osh Kosh! 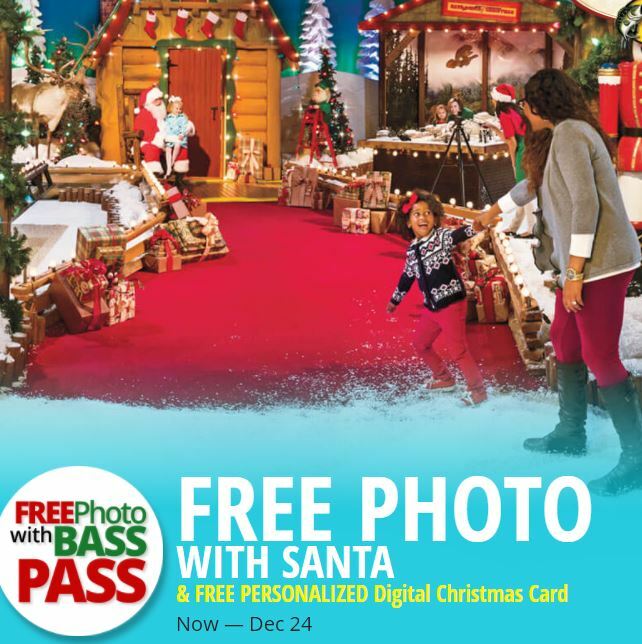 Sign up and receive coupons and exclusive offers from Carter’s and OshKosh B’gosh! Sign up now for a special exclusive coupon!